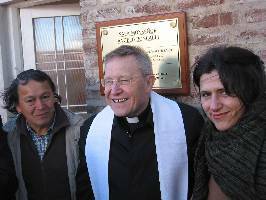 On Saturday, July 10, 2004, Cardinal Walter Kasper, President of the Pontifical Commission for the Relations with the Jews, inaugurated the ”Monsignor Angelo Roncalli” Kindergarten at the Raoul Wallenberg Community Center of the Movement of Unemployed Workers of La Matanza (MTDLM), in Gregorio de Laferrere, province of Buenos Aires. The ceremony was organized by the International Raoul Wallenberg Foundation and the Economic General Confederation of the Argentine Republic, presided by Ricardo Faerman. Cardinal Kasper, accompanied by the leader of the MTDLM, Toti Flores, Faerman and Mrs. Susana Caramelo, member of the Executive Council of the IRWF, unveiled the a commemorative plaque of Monsignor Roncalli installed at the entrance of the classroom. The kindergarten is attended daily by sixty children of low-income families that work in the several workshops of the Wallenberg Center. Toti Flores welcomed Cardinal Kasper who was warmly received by the children, who sang an allusive song composed for the occasion. 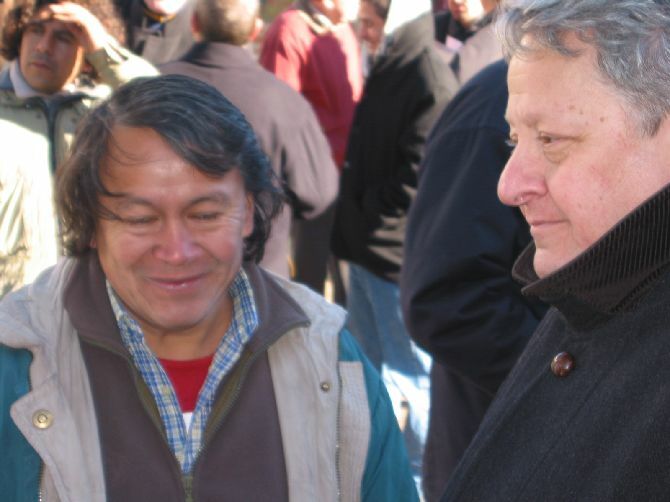 Flores stressed the independent character of his movement, that does not receive subsides from the state of any kind. ”Work dignifies man, not privileges or hollow charities”, he said. Cardinal Kasper transmited to the attendance greetings from Pope John Paul II and blessed not only the plaque but also the Kindergarten, along with the Bishop of Laferrere, Monsignor Juan Horacio Suárez. In one of the most emotional moments of the ceremony, Mrs. Majo Faerman presented to the children three complete sets of winter cloths for each one of them. The Cardinal was born in Heidenheim-Brenz, Germany, in 1933 and was ordained priest in 1957. Accomplished Theologian and author of many books and critical essays, Kasper studied at the University of Tübingen where he later became professor of Dogmatic Theology. On October 3, 2001, Pope John Paul II appointed him President of the Pontifical Council for Promoting Christian Unity, succeeding Cardinal Edward Idris Cassidy. Cardinal Kasper also assumed as President of the Commission for Religious Relations with the Jews. Monsignor Angelo Roncalli is a key figure in the modern history of Catholicism and the relations with Judaism. In 1958 he was appointed Pope with the name of John XXIII. Long before, in 1944, he was responsible of organizing one of the largest rescue missions of Jews and other persecuted by Nazism during the Holocaust. As Vatican Apostolic Delegate in Istanbul, he granted tens of thousands of false baptismal certificates to Jews condemned to a certain death in the extermination camps.